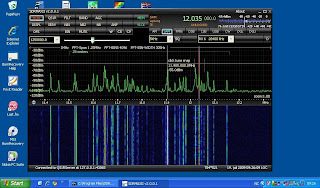 In previous postings, I have tested the SDR-IQ and the Perseus on the MSI Wind netbook, to see if relatively low powered netbooks can run processor-intensive software like software defined receivers. I was able to run two parallel instances of the SDR-IQ, and I also managed to run the Perseus in 1600 kHz recording mode when I overclocked the processor. All well so far. So what about the QS1R? It appears to demand a little more from the processor than the Perseus, but the graphical user interface is responsible for most of the load. Once the GUI is minimised, the QS1R runs very light indeed. Otherwise, CPU load is around 20-40 %. I tried to lower the Panadapter Update Rate to around 5 fps and that may have caused a slight reduction in CPU load. The GUI is scaleable, which is an advantage over Perseus with its fixed window size. Perseus is a little too large for the Wind's 1000 x 600 display, while QS1R can be adjusted to fit. Since a recording function is not yet implemented, I don't know how well the Wind will handle a QS1R in recording mode. The picture shows the QS1R in demod mode. The conclusion is: There is no problem running a QS1R with a netbook like the MSI Wind or similar. The processor is an Intel N270 Atom running on 1.6 GHz. This, and newer Atoms with higher speeds, are found in many netbooks nowadays. The Quad Delta Flag Array (QDFA) which was tested with great success in Grayland, WA is going to be tested in Kongsfjord too this autumn. Supports are being bought and built, and 10 (!) 5-metre fishing rods were bought at a Finnish travel fair a few weeks ago. And the "Central Processing Unit", the phaser, arrived from the US today, thanks Dallas. 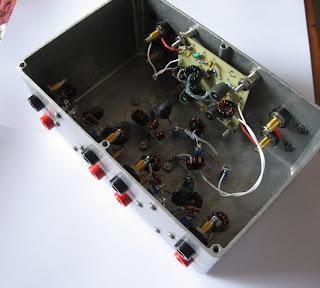 Two 17Ah batteries are on their way, to power the 30mA Norton push-pull preamp (see photo). And lots of other stuff needs to be purchased, not least proper weather insulation. The Arctic winter only meters on shore is a hostile environment. Needless to say we are very excited as to how well this new antenna design will perform here. 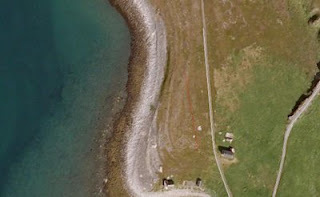 The air photo shows the layout of the QDFA as a red line. My cabin is on the right. July 11 Update! A high-res picture of the phasing box is here.